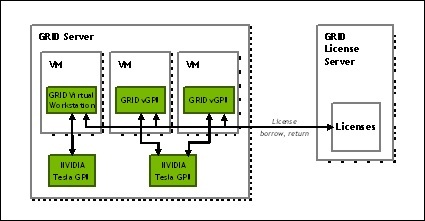 The NVIDIA GRID License Manager provides the necessary tools to monitor GRID license usage for capacity planning. It can be installed on a physical server or in a dedicated Virtual Machine (VM). When a client VM with licensed features such as GRID Virtual Workstation or GRID Virtual PC is booted, it checks out a license from the license server. The license is returned when the VM shuts down. To improve end user experience, the GRID software will run with or without a valid license server connection. This is done to ensure that user experience is not impacted by license overages or connection issues. The license server will allow the IT administrator to track license usage and determine correct sizing for their environments. In compliance with the EULA, IT administrators may also use any other method that reliably tracks the software usage to ensure they have enough licenses for their CCU usage. A detailed user guide with instructions on how to install and operate the license manager is available as part of the license manager download package.